Popcorn is an age-old snack that’s been reinvented – several times – to suit the needs of our evolving lifestyles. In the process, it’s picked up some nasty hitchhikers like diacetyls, artificial flavours and preservatives. This week, swap out your microwave popcorn for some old-fashioned, homemade stuff. When I was a kid, I loved when my parents would dig out the air popper from the basement before our Friday-night movie. My brother and I would sit at the counter, faces glued to the amber plastic cube at the top, waiting for the first kernel to shoot out into our bowl. When they were all popped, my mom would melt some butter and sprinkle with salt. It was truly a treat. As the years went on, the magic trickled away and we had less patience for popping corn. Conveniently, microwave popcorn (and our microwave) arrived on the scene and we could push a button and simply wait three minutes…or until there were at least five seconds between “pops”. 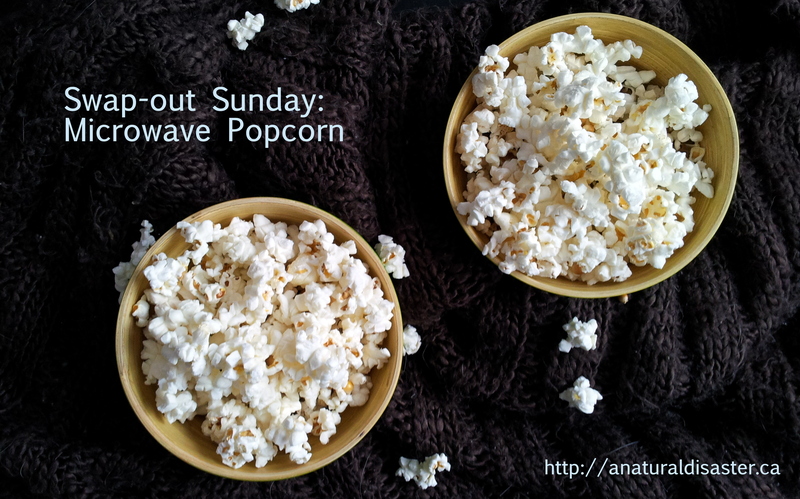 Microwave popcorn (in all its marketed low-fat glory) was one of my staple snacks when I first heard, about 10 years ago, that someone had found a link between working at the microwave popcorn factory and death from lung problems (here’s a more recent article). Seems those butter-flavoured diacetyl fumes weren’t good for the workers. If that was the case, how could they be good for us? You see, microwave popcorn isn’t just popcorn in a bag. Tucked in with those unpopped kernels are additives like tertiary butylhydroquinone (TBHQ, a controversial preservative), artificial or natural flavours, palm oil, and less real butter than you’d expect, even in packages that say things like “Butter-Flavoured” and “Extreme Butter”. Everything in that bag is heated until steamy and easily breathable/consumable. This 2012 paper says “BFMP [butter-flavoured microwave popcorn] poses a significant respiratory risk to consumers” (although, to be fair, apparently cooling the bag before opening it can help). Some of the packages highlight the positive attributes of popcorn by saying “100% whole grain” and “no artificial colours” or “low fat” – but don’t let that distract you from the real issues: artificial flavours, oils you wouldn’t use at home, and preservatives. Orville Redenbacher butter flavour (ingredients from my local grocery store) 100% whole grain popping corn, palm oil (contains TBHQ, citric acid), salt, natural and artificial butter flavour, butter, potassium chloride, colour (annatto, turmeric, paprika). President’s Choice Butter Flavour Popping corn, palm oil, salt, natural butter flavour (contains milk), annatto (contains soybean oil). President’s Choice Organic Natural Flavour popcorn Organic popping corn, organic palm oil, salt. Contains unnatural preservatives and additives. Toppings – no matter what shakeable or pourable flavour you buy, they’re not made from the real-food ingredients you’d use at home. Most have added flavours to make the minimal amount of real butter stretch farther. The flavours in Orville Redenbacher bags have 16 ingredients, including corn syrup, hydrogenated soybean oil and disodium inosinate…not exactly ingredients you’d drizzle over your popcorn at home. Luckily, doing so is ridiculously easy, even if you’re impaitent like me. Your ingredient list will be: Popcorn, oil (optional), butter (optional), salt (optional). There are apparently some issues with the processing of vegetable oils like canola, grapeseed etc. so which type of oil you use, and if you use it, is up to you. 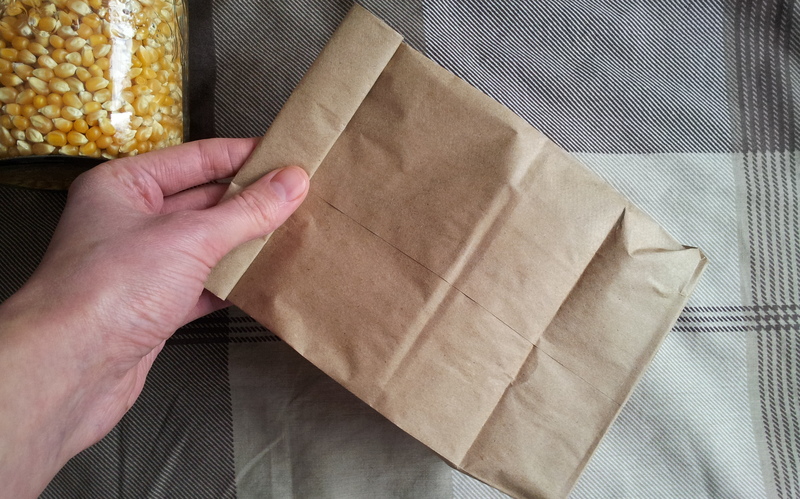 Place ¼ cup popcorn in a brown paper bag. 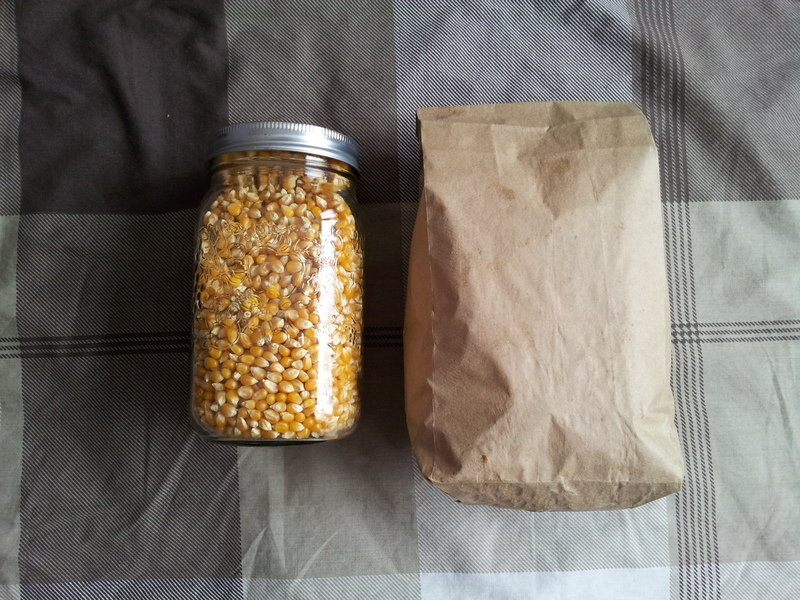 Fold over the top a few times to keep the kernels in. Microwave on high for 2 to 3 minutes; until there are 5 seconds or more between pops. Coat the bottom of a heavy pot with vegetable oil. Turn the burner onto medium-high heat. 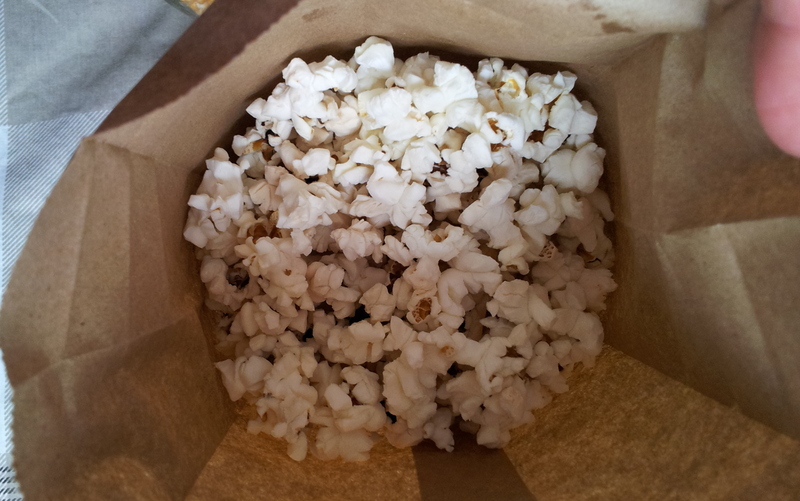 Add ½ cup popcorn. Put the lid on. When the oil starts to sizzle, shake the pot gently and regularly. 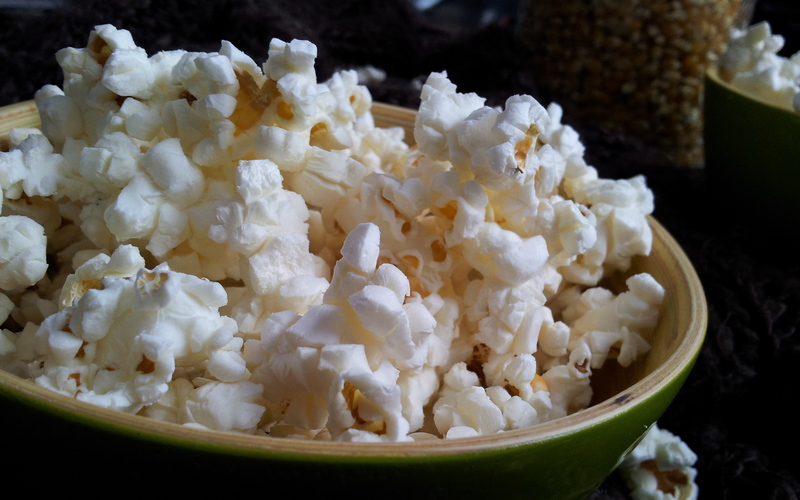 The kernels will start to pop; continue swirling and shaking to make sure they don’t get stuck to the bottom and burn.